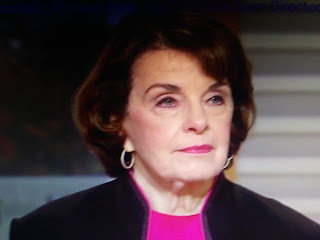 Dianne Feinstein is a loathsome piece of filth and a disgrace to the Senate. That really says something considering the cast of bad characters who infested the Senate. Start with Ted Kennedy who got away with murder on through Richard Blumenthal who lied about serving in Viet Nam having never set foot thee during the war. Democrat leaders and their liberal aides, along with professional agitators, are all intermingled and conspiring together to achieve the same objective — in this case, to spike the confirmation of President Trump’s Supreme Court nominee, Brett Kavanaugh. Hill Republicans claim Democratic Sen. Dianne Feinstein engineered the knee-capping of Kavanaugh from both inside and outside Congress — and they have a strong case, though Feinstein insists she merely dealt cards she was handed. For starters, they argue that Feinstein, who is the top Democrat on the Senate committee vetting Kavanaugh, orchestrated an “11th-hour ambush” of the conservative nod by withholding a letter from the committee’s Republican majority alleging sexual misconduct by Kavanaugh until the day the panel was preparing to take a vote to confirm him — almost two months after receiving the letter and well after the vetting and hearing process.